After a leisurely stroll through Tohono Chul Park, I did some shopping at their excellent nursery. The selection of desert natives is impressive, and the prices are very reasonable. Stop #2 was at Ted deGrazia’s Gallery in the Sun. I had wanted to visit for years but it never worked out—until now. Ted de Grazia’s paintings have as many detractors as they have fans, but no matter where you stand on that matter, there’s little disagreement that his adobe compound—built by himself with help from Indian friends—is a landmark. I spent over two hours taking photos. Stop #3 was at Mesquite Valley Growers, Tucson’s largest full-service nursery. They have a huge selection of plants in every conceivable category. This incudes succulents, of course. And not just small plants, but everything up to 24” boxes. Lots of cholla skeletons at great prices. I’m bringing one home! Tomorrow I’m heading north to Phoenix and then back to California. This morning I drove from Phoenix (Scottsdale, to be precise) to Tucson. The drive is usually under two hours but I stopped a bunch of times to take photos of the dramatic clouds. When I got to Tucson, I briefly stopped at Cathedral of Saint Augustine. What a stunning building, especially against a blue sky! Continuing in my effort to see places I’ve not visited before, I spent almost two hours leisurely strolling through Barrio Santa Rosa, one of Tucson’s oldest neighborhoods. It is known for its Sonoran row houses which abut the street and hence have no front yard (and just a tiny backyard). In recent decades, many of these adobe structures have been restored and painted vibrant colors. Barrio Rosa, Tucson. The trees on the left are palo blanco (Mariosousa willardiana), my most recent tree crush. I’ve been to Tucson enough times now to lose count, but there is one place I visit on every trip: Mission San Xavier del Bac, just south of the city. It’s one of my favorite spots in the entire world. I’m not Catholic (or religious) but the mission, built between 1783 and 1797, is one of the most beautiful structures I’ve ever seen. Plus, it has lots of cacti and other succulents. Next stop: Greg Starr’s house on the west side of Tucson. It’s been two years since my first visit, and although I’ve seen Greg twice in between, it was a real treat to revisit his home turf. Special post to follow! Although I had originally planned to swing by the Arizona Sonora Desert Museum, I was too tired so I made beeline for my home-away-from-home for the next two nights: the Lodge on the Desert. I don’t know how I found this place when I was planning my trip, but I’m so glad I picked it. Check out the grounds! It’s definitely not the cheapest place to stay in Tucson, but if this were, say, Palm Springs, it would cost at least twice as much! In fact, the Motel 6 (!) I stayed in during the Succulent Extravaganza in Castroville, CA at the end of September was 30% more expensive than the Lodge on the Desert! It’s that time of year again: I’m on my yearly road trip to Arizona. I arrived in Phoenix at 1 p.m. and spent the rest of the day at the Desert Botanical garden (with a 90 minute break). My self-imposed schedule is so crazy this year that I won’t be able to blog from the road like I usually do. But I’ll make up for it when I get back home. To whet your appetite, here are a few photos from the Desert Botanical Garden. The best photos are yet to come! The big attraction at the Desert Botanical Garden right now is Sonoran Light, an exhibition of eight large-scale light installations by British artist Bruce Monro. They are pure magic—no exaggeration. More photos in a later post. A friend just shared this photo from Fiesta Americana Condesa Resort in Cancún, Mexico where they are spending Christmas. I love the giant red balls in front of the steel blue agaves. The agaves look like Agave tequilana to me. Photo © 2015 Linda Lindert. All rights reserved. A month ago we had a white Thanksgiving at my mother-in-law’s place in Mount Shasta. That was a wonderful surprise, considering it doesn’t often snow that early any more. Whatever you celebrate at this time of year, may it be magical and filled with joy and love. Not gardening- or plant-related but curious anyway, at least to me: Considering the number of paint colors to choose from when you buy a car, why would anybody choose this color? What is it anyway? Thousand Island Dressing Gone Bad? Essence of Flamingo? Or a new experimental Pepto Bismol flavor—maybe Saucy Shrimp? And why would auto makers even offer this color? I’m all for personal expression, beauty is in the eye of the beholder, and all that stuff, but this is seriously painful. I’m secretly hoping the owner of this car won it in a contest or contest—i.e. didn’t pay for it with their own money. I can’t remember a December when work has been so busy; I’ve barely had time to go outside. The weather has been nice enough, with just a few nights near or a tad below freezing, and the occasional rain shower to keep things hydrated. I continue to keep my fingers crossed for a mild winter with enough rain (and snow in the mountains) to make a dent in the huge water deficit that has accrued because of the drought. This photo might give you the impression that it rained a lot in December 2014. Far from it. December was very dry. But the few times it did rain, it came down so hard that the storm drains couldn’t keep up. We had a brief but violent rain storm on Sunday morning that dumped about ⅓" of rain in a short period of time, overwhelming the capacity of drainage pipes and sewers. Crossing this unexpected river in our small Honda Civic was the most excitement I've had all month! 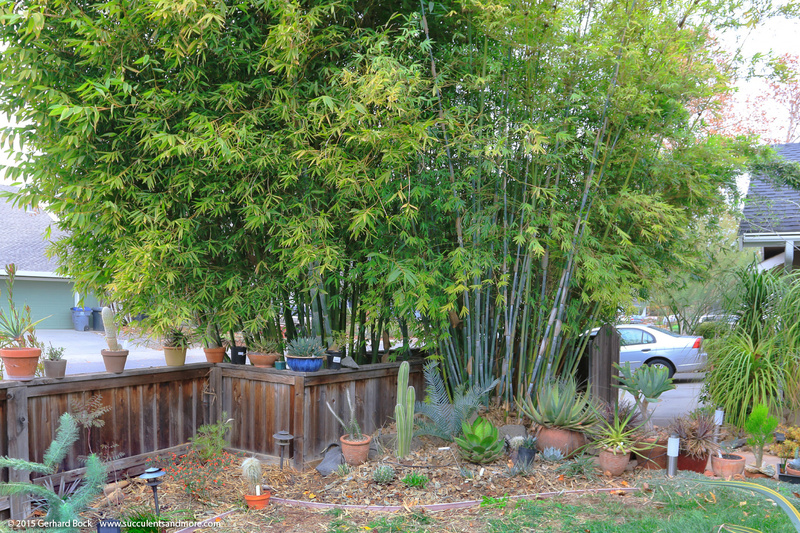 A few weeks ago I gave the Asian lemon bamboo (Bambusa eutuldoides ‘Viridivittata’) in the front yard a radical trim. I was so happy with the result that yesterday I decided to tackle two more bamboos: the Baby Blue (Bambusa chungii 'Barbellata') and Alphonse Karr (Bambusa multiplex 'Alphonse Karr'). I didn't thin these clumps as much as I did the Asian lemon but the difference is still noticeable--and very pleasing, I think. The other day I showed you how the winter-blooming aloes in my front yard are doing. Some should be in flower at or shortly after Christmas, depending on how many warm days we get between now and then. 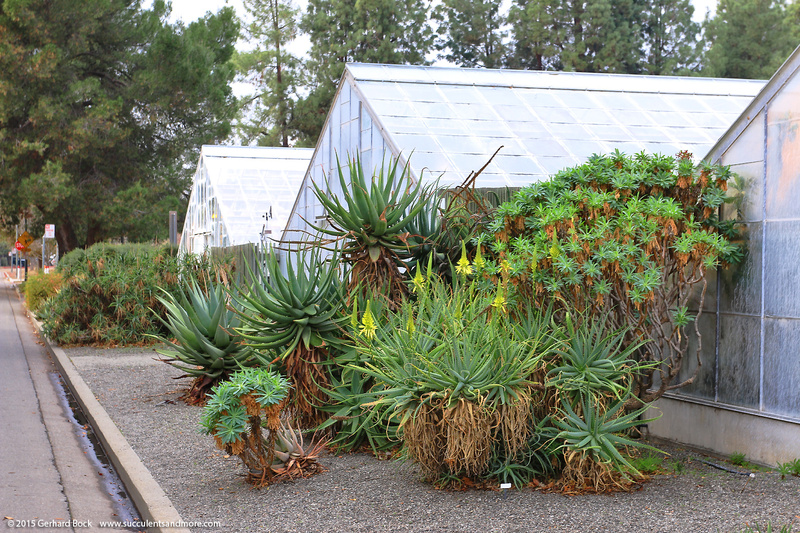 I also took a quick trip to the UC Davis campus on Sunday to check on the progress of their aloes. They have some very nice plantings (see here). Move over, mellow yellow. Ginkgo yellow is the new kid in town. At least for a few more days. All the photos in this vignette were taken last Sunday on the UC Davis campus, less than ten minutes from my house. I was checking on their aloes (post to come) and came across these ginkgos that were just screaming to be photographed. Leaves are falling from the trees and many plants are getting ready for a long winter’s nap. Many aloes, on the other hand, are doing the opposite: They’re gearing up to bloom. Here’s a quick look at the aloes in my garden that are sending up flower spikes. Aloe ‘Erik the Red’. This is a complex hybrid from South African breeder Leo Thamm (Sunbird Aloes). A month ago the leaves were mostly green; the recent cold has really brought out the red. I’m fond of this barrel cactus. I brought it home from Mariscal Cactus & Succulents in Desert Hot Springs on our February 2011 trip to the Southern California desert. The guy at the nursery said it was a “fishhook cactus,” which I took to mean Ferocactus wislizeni. However, when Greg Starr was here in the spring, he thought it was Ferocactus herrareae, which some taxonomists consider a subspecies of Ferocactus wislizeni. Whatever it may be, exactly, I’m emotionally attached to it, nasty spines and all. Take a look at the photo below. From a distance it looks good, doesn’t it? We spent Thanksgiving at my mother-in-law’s place in Mount Shasta in the mountains of far northern California. On Wednesday, we had a nice dusting of snow—about an inch—but Thanksgiving day proper gave us brilliant blue skies, crisp air, and plenty of sunshine. After breakfast I did some exploring, braving the 20°F temperature. I hope the photos will give you an idea of how beautiful this part of California is. In yesterday’s post I mentioned that it was trying to snow as we were arriving at my mother-in-law’s house in Mount Shasta in the mountains of far northern California. As I went to bed last night, I was hoping to find a winter wonderland in the morning. And to my delight I did. In fact, it was still snowing at 8 a.m. this morning. I quickly grabbed my camera and took some photos on my mother-in-law’s two-acre property. Get ready for some picture-postcard loveliness! This means that there’ll be good color for another few weeks, provided we don’t get a lot of wind that would knock the leaves off the trees. California is in year 4 of the drought. and the state is subject to mandatory water conservation. This summer I switched to a once-a-week watering regime. I knew the succulents and perennials would be able to handle it, but I wasn’t sure about the bamboos. While the running bamboos in the stock tanks in the backyard did suffer, the clumpers in the ground didn’t miss a beat. In fact, they produced more new culms this year than in previous years! As a result, the clumps have gotten quite congested—to the point where they need a good thinning out. 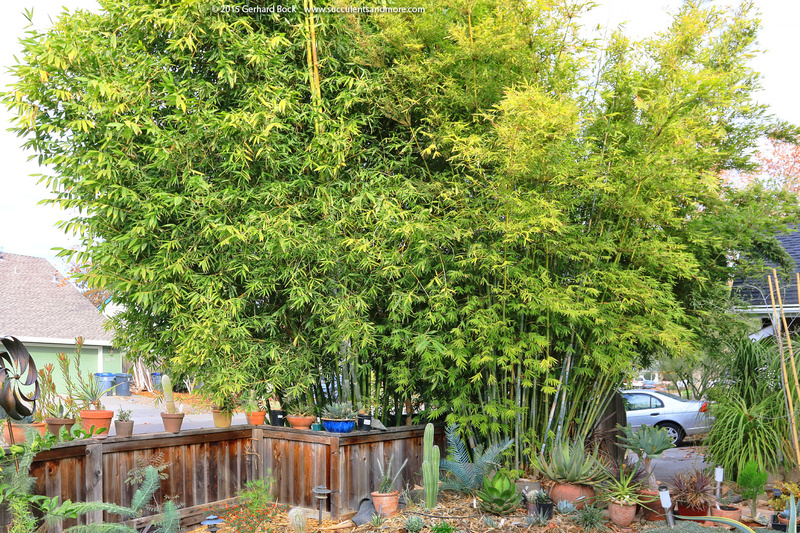 I tackled the most urgent case today: the Asian lemon bamboo (Bambusa eutuldoides ‘Viridivittata’—say that three times fast!) next to the front porch. As you can see, it’s gotten huge and has been casting too much shade on everything around it. This is not the look and feel I want. Can you see the large sago palm (Cycas revoluta) at the base of the bamboo? Look closely, it’s there.